BCS Oxfordshire Branch Christmas Lecture Thursday 7 December 2006: The Machine That Enjoys Christmas: Whither Machine Consciousness? Posted December 7, 2006 by grohling & filed under Uncategorized. The Machine That Enjoys Christmas: Whither Machine Consciousness? Our speaker was Igor Aleksander (right), Emeritus Professor in the Intelligent Systems and Networks Group at Imperial College. Igor gave us a great evening. His talk was stimulating, thought provoking and funny. He used lots of pictorial aids to express his ideas. 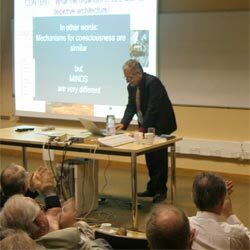 He started by discussing what we mean by consciousness and why we find it difficult to attribute consciousness to robots. An industrial robot, as used on an assembly line, doesn’t really need to be conscious, but the Mars Exploration Rover vehicle does need enough consciousness to sense when its batteries were low and to avoid rocks which might flip it over. 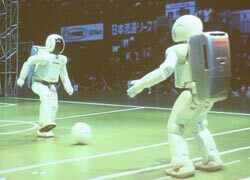 On the other hand, Honda’s Asimo robots manage to play football without very much intelligence. Igor posed the question "After so many eminent philosophers, from Socrates through Aquinas, Locke to Wittgenstein and the present day, had tried to understand the mind, would it be heresy for an engineer to have a go?" PRESENCE: I feel in the middle of an out-there world. IMAGINATION: I can imagine worlds I have and have not perceived. ATTENTION: I focus on what is important to me. EMOTION: I evaluate options open to me. These axioms were defined in a paper presented at AISB 05, which went on to suggest a ‘kernel architecture’ capable of supporting the five axioms. To demonstrate that we can’t always trust our observations, he showed us a short movie and asked us to concentrate on one particular aspect and report our results. If you weren’t there and would like to see the movie, you can find it as demo 15, together with further examples on the University of Illinois Visual Cognition Lab website. 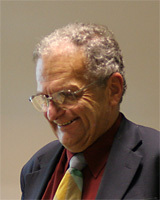 Igor described the pattern recognition performed by neurons in the brain, how these techniques had been used in cancer screening, and demonstrated a "virtual machine" programme which had been built to study visual consciousness. As time ran out, comparing human brains with insects and robots, Igor concluded that "Mechanisms for consciousness are similar, but MINDS are very different". After a lively question time, and to the applause of the packed audience, many of us then went off for minced pies and mulled wine at the Lamb and Flag: a good ending to a delightful evening.